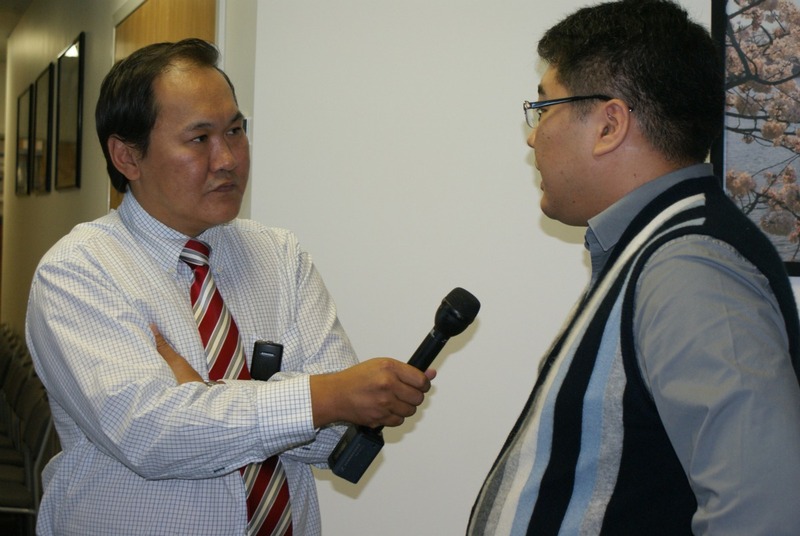 On October 7, 2011 Colors of America, one of the popular programs of Ulaanbaatar Broadcasting System which is the second largest channel in Mongolia, visited at VIU. One of VIU’s Mongolian students, Undraa Togosbold participated in this program in order to introduce our school and students’ life in the USA. Ms.Undraa who invited ‘Colors of America’ received her Bachelor’s Degree in Business Administration, in Japan. Now she is studying for her MBA at VIU, with a major in Accounting. VIU has several Mongolian students who study a variety of programs including ESL, BBA, MBA, MIS and more. The percentage of students of Mongolian decent in the student body is increasing annually. For that instance the visit of ‘Colors of America’ was important for VIU. Mr. Batbayar, the producer of the program conducted an interview with Dr. Isa Sarac, President of Virginia International University, Mr. Bayarjargal Battulga, Business Manager and Ms. Emily Leighty, Admissions Officer. Dr. Sarac stated our school’s mission, vision and goals including his objective to increase number of Mongolian students and to expand our relationship with Mongolia, as a whole. Dr. Sarac mentioned that even though he founded higher education businesses in Europe, the USA was unique place where students can gain modern, up-to-date education. It means people can receive the most quality-oriented education only in USA compared with other nations. There are many reasons for international students choosing VIU. First of all, VIU is a non-profit and young University. Every year, the number of students is growing by 10%. Secondly, VIU has small-sized class where everyone can have attention from their professors and communicate with them easily. Students can develop and improve academically and personally much faster when compared with larger Universities. In some larger Universities students have huge lecture rooms where one cannot receive individual attention. Third, VIU began implementing many programs intended for improving study quality such as tuition fee scholarship. Currently, VIU is working with Educational Institutes around the world and particularly with 25 International Schools in order to have special regulation on exchanging students and course credits. VIU is located near Washington DC, the center of economy and business in the world. The ‘Colors of America’ program will be aired on Tuesday, October 11, 2001 on the Mongolian Television Network, Ulaanbaatar Broadcasting System. You may also find the video on two popular Mongolian Websites which are www.medeelel.com and www.orloo.com, or by clicking the link at the beginning of this article.